What is coronary bypass graft surgery? 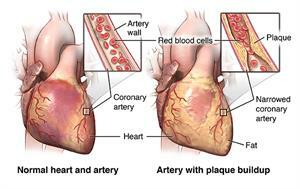 Coronary artery bypass graft surgery (CABG) is a procedure used to treat coronary artery disease. Coronary artery disease (CAD) is the narrowing of the coronary arteries – the blood vessels that supply oxygen and nutrients to the heart muscle. CAD is caused by a build-up of fatty material within the walls of the arteries. This build-up narrows the inside of the arteries, limiting the supply of oxygen-rich blood to the heart muscle. 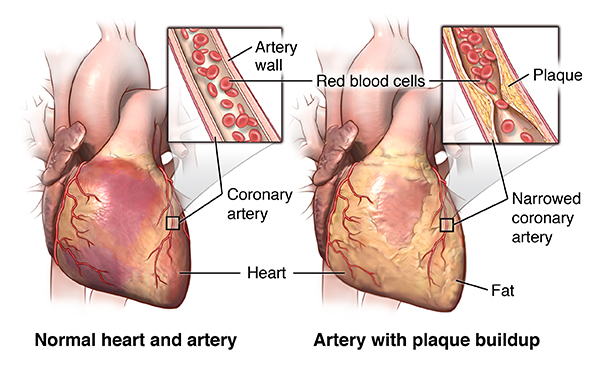 One way to treat the blocked or narrowed arteries is to bypass the blocked portion of the coronary artery with a piece of a healthy blood vessel from elsewhere in your body. Blood vessels, or grafts, used for the bypass procedure may be pieces of a vein from your leg or an artery in your chest. An artery from your wrist may also be used. Your doctor attaches one end of the graft above the blockage and the other end below the blockage. Blood bypasses the blockage by going through the new graft to reach the heart muscle. This is called coronary artery bypass surgery. Traditionally, to bypass the blocked coronary artery, your doctor makes a large incision in the chest and temporarily stops the heart. To open the chest, your doctor cuts the breastbone (sternum) in half lengthwise and spreads it apart. Once the heart is exposed, your doctor inserts tubes into the heart so that the blood can be pumped through the body by a heart-lung bypass machine. The bypass machine is necessary to pump blood while the heart is stopped. While the traditional "open heart" procedure is still commonly done and often preferred in many situations, less invasive techniques have been developed to bypass blocked coronary arteries. "Off-pump" procedures, in which the heart does not have to be stopped, were developed in the 1990's. Other minimally invasive procedures, such as keyhole surgery (done through very small incisions) and robotic procedures (done with the aid of a moving mechanical device), may be used. Why might I need coronary artery bypass surgery? Your doctor uses coronary artery bypass graft surgery (CABG) to treat a blockage or narrowing of one or more of the coronary arteries to restore the blood supply to your heart muscle. Unfortunately, you may not have any symptoms in early coronary artery disease, yet the disease will continue to progress until there’s enough artery blockage to cause symptoms and problems. If the blood supply to your heart muscle continues to decrease as a result of increasing blockage of a coronary artery, you may have a heart attack. If the blood flow can’t be restored to the particular area of the heart muscle affected, the tissue dies. There may be other reasons for your doctor to recommend CABG surgery. What are the risks of coronary artery bypass surgery? There may be other risks depending on your specific medical condition. Be sure to discuss any concerns with your doctor before the procedure. How do I get ready for coronary artery bypass surgery? You will be asked to sign a consent form that gives your permission to do the test. Read the form carefully and ask questions if anything is unclear. 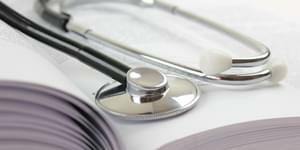 Along with a review of your health history, your doctor may do a complete physical exam to make sure you are in otherwise good health before having the procedure. You may need blood tests or other diagnostic tests. You will be asked to not eat or drink for 8 hours before the procedure, generally after midnight. You may be asked to shower with a soap or special cleanser the night before and the morning of surgery. Tell your doctor if you are pregnant or think you could be. Tell your doctor if you are sensitive to or are allergic to any medicines, iodine, latex, tape, or anesthetic medicines (local and general). Tell your doctor about all medicines (prescription and over-the-counter), vitamins, herbs, and supplements that you are taking. Tell your doctor if you have a history of bleeding disorders or if you are taking any blood-thinning medicines, aspirin, or other medicines that affect blood clotting. You may be told to stop some of these medicines before the procedure. Your doctor may do blood tests before the procedure to find out how long it takes your blood to clot. Tell your doctor if you have a pacemaker or any other implanted cardiac device. If you smoke, stop smoking as soon as possible. This may improve your chances for a successful recovery from surgery and benefit your overall health. Based on your medical condition, your doctor may ask you to do other things to get ready. What happens during coronary artery bypass? Coronary artery bypass graft surgery (CABG) requires a stay in a hospital. Procedure may vary depending on your condition and your doctor's practices. A healthcare professional will insert an intravenous (IV) line in your arm or hand. Other catheters will be put in your neck and wrist to monitor your heart and blood pressure, as well as to take blood samples. You will lie on your back on an operating table. The anesthesiologist will continuously monitor your heart rate, blood pressure, breathing, and blood oxygen level during the surgery. Once you are sedated (put into a deep sleep), a breathing tube will be put into your throat and you will be connected to a ventilator, which will breathe for you during the surgery. A catheter will be put into your bladder to drain urine. The skin over the surgical site will be cleaned with an antiseptic solution. Once all the tubes and monitors are in place, your doctor will make incisions (cuts) in one or both of your legs or one of your wrists to access the blood vessel(s) to be used for the grafts. He or she will remove the vessel(s) and close those incision(s). The doctor will make an incision (cut) down the center of your chest from just below the Adam's apple to just above the navel. The doctor will cut the sternum (breastbone) in half lengthwise. He or she will separate the halves of the breastbone and spread them apart to expose your heart. To sew the grafts onto the very small coronary arteries, your doctor will need to stop your heart temporarily. Tubes will be put into the heart so that your blood can be pumped through your body by a heart-lung bypass machine. Once the blood has been diverted into the bypass machine for pumping, your doctor will stop the heart by injecting it with a cold solution. When the heart has been stopped, the doctor will do the bypass graft procedure by sewing one end of a section of vein over a tiny opening made in the aorta, and the other end over a tiny opening made in the coronary artery just below the blockage. If your doctor uses the internal mammary artery inside your chest as a bypass graft, the lower end of the artery will be cut from inside the chest and sewn over an opening made in the coronary artery below the blockage. You may need more than one bypass graft done, depending on how many blockages you have and where they are located. After all the grafts have been completed, the doctor will closely check them as blood runs through them to make sure they are working. Once the bypass grafts have been checked, the doctor will let the blood circulating through the bypass machine back into your heart and he or she will remove the tubes to the machine. Your heart may restart on its own, or a mild electric shock may be used to restart it. Your doctor may put temporary wires for pacing into your heart. These wires can be attached to a pacemaker and your heart can be paced, if needed, during the initial recovery period. Once your doctor has opened the chest, he or she will stabilize the area around the artery to be bypassed with a special instrument. The rest of the heart will continue to function and pump blood through the body. The heart-lung bypass machine and the person who runs it may be kept on stand-by just in case the procedure need to be completed on bypass. The doctor will do the bypass graft procedure by sewing one end of a section of vein over a tiny opening made in the aorta, and the other end over a tiny opening made in the coronary artery just below the blockage. You may have more than one bypass graft done, depending on how many blockages you have and where they are located. Before the chest is closed, the doctor will closely examine the grafts to make sure they are working. Your doctor will sew the sternum together with small wires (like those sometimes used to repair a broken bone). He or she will insert tubes into your chest to drain blood and other fluids from around the heart. Your doctor will sew the skin over the sternum back together. Your doctor will put a tube through your mouth or nose into your stomach to drain stomach fluids. He or she will then apply a sterile bandage or dressing. What happens after coronary artery bypass surgery? After the surgery, you may be taken to the recovery room and then the intensive care unit (ICU) to be closely monitored. Machines will constantly display your electrocardiogram (ECG) tracing, blood pressure, other pressure readings, breathing rate, and your oxygen level. 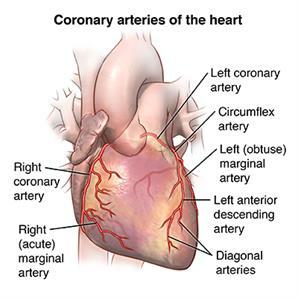 Coronary artery bypass surgery (CABG) requires an in-hospital stay of at least several days. You will most likely have a tube in your throat to help with breathing through a ventilator (breathing machine) until you are stable enough to breathe on your own. As you continue to wake up from the anesthesia and start to breathe on your own, your doctor can adjust the breathing machine to allow you to take over more of the breathing. When you are awake enough to breathe completely on your own and you are able to cough, your doctor will remove the breathing tube. In most cases, the breathing tube is removed soon after the operation, usually the same day or by early the next morning. Your doctor will also remove the stomach tube at this time. After the breathing tube is out, a nurse will help you cough and take deep breaths every couple of hours. This will be uncomfortable due to soreness, but it is very important that you do this to keep mucus from collecting in your lungs and possibly causing pneumonia. Your nurse will show you how to hug a pillow tightly against your chest while coughing to help ease the discomfort. The surgical incision may be tender or sore for several days after a CABG procedure. Take a pain reliever for soreness as recommended by your doctor. Aspirin or certain other pain medicines may increase the chance of bleeding. Be sure to take only recommended medicines. Your doctor may delivery medicines through the IV to help your blood pressure and your heart, and to control any problems with bleeding. As your condition stabilizes, he or she will gradually decrease and then stop these medicines. Once your doctor removes the breathing and stomach tubes and you are stable, you may start to drink liquids. You can gradually include more solid foods as you can handle them. When your doctor determines that you are ready, you will be moved from the ICU to a post-surgical nursing unit. Your recovery will continue there. You can gradually increase your activity as you get out of bed and walk around for longer periods. You can eat solid foods as soon as you can tolerate them. 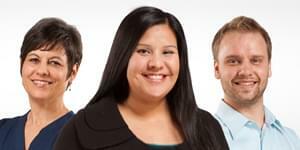 A member of your care team will arrange for you to go home and schedule a follow-up visit with your doctor. Once you are home, it will be important to keep the surgical area clean and dry. Your doctor will give you specific bathing instructions. Your doctor will remove the sutures or surgical staples during a follow-up office visit, if they were not removed before leaving the hospital. Do not drive until your doctor tells you it's OK. You may have other activity restrictions. Your doctor may give you other instructions after the procedure, depending on your situation.